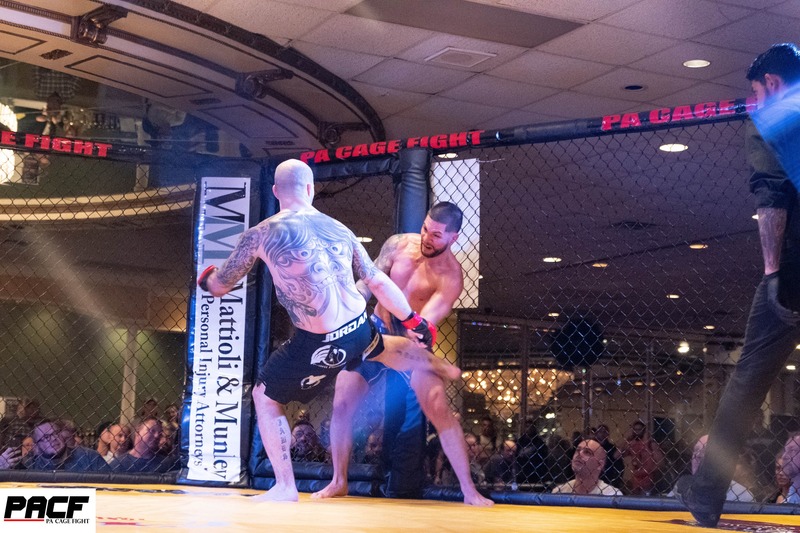 Pennsylvania’s longest running mixed martial arts promotion, PA Cage Fight, returns to Wilkes-Barre tonight with PA Cage Fight 34. In the main event, a welterweight bout between the fighter who holds the record for the most fights with the promotion, Jimmy Jordan, taking on Rick Nuno. The fight card kicks off off at Genetti’s Hotel at 7:30 p.m., and features several title bouts for MMA fans to enjoy. 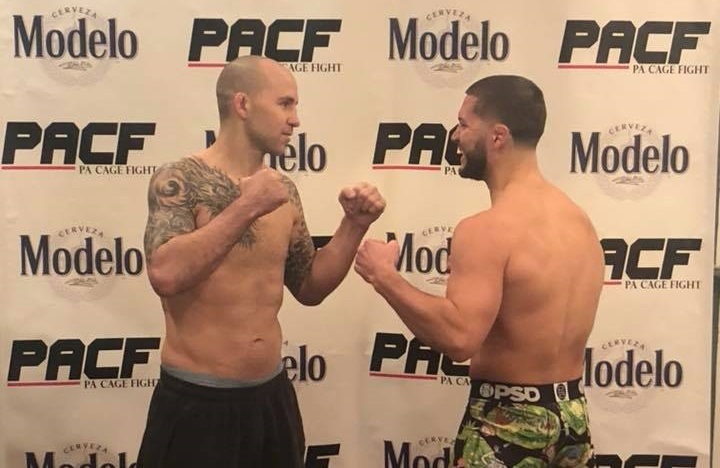 U.S. Marine Corps veteran Tanner Leed of Ephrata Martial Arts looked to secure his first amateur victory as he took on Luis Anguiera in the night’s opening bout. This was an absolute dog fight. Anguiera was rocking Leed at the start, but the ‘never quit’ attitude of the Marine kicked in and he landed a huge uppercut that dropped his opponent. Anguiera appeared to be out and his mouthpiece came flying out. He was able to crawl to his knee and referee Jimmy Chappell temporarily stopped the fight. The action continues back on the feet and a few seconds later Anguiera is dropped again. With just 20 seconds left in the round Leed attempts to work a rear-naked choke before time expires. Round two starts and immediately Anguiera shoots in and Leed throws a knee. Anguiera drops and Chappell jumps in to stop the fight. Blood flows from the nose of Anguiera who appears to be in significant pain. It in unsure as to what the result will be here. Moments later the fight is called off and Anguiera is declared the victor due to disqualification. Rock Em’ Sock Em’ Robots here in the second fight between Josh Jones and Troy Potts. No time for inactivity between these two. For every jab one threw, the other threw a right with everything they had in store. This went on for two full minutes before the bell tolled. Round two picks up exactly where one left off, back and forth brawl. Potts lands a takedown and moments later blood is all over the back of Jones. When they stand it is apparent that Potts has been busted open. A few seconds later the ref calls for time. It looked as if he was going to have a cageside physician take a look at Potts but it was actually to give a warning to Potts for reaching with open fingers. Chappell told Potts that if he did it again he would take a point. The fight resumes and will continue to a third frame. Round three starts and immediately Jones is rocked from a big right hand. He is pushed up against the cage. Jones is now bleeding from his nose. They continue to brawl, the fight goes to the ground and Jones is leaking all over Potts. 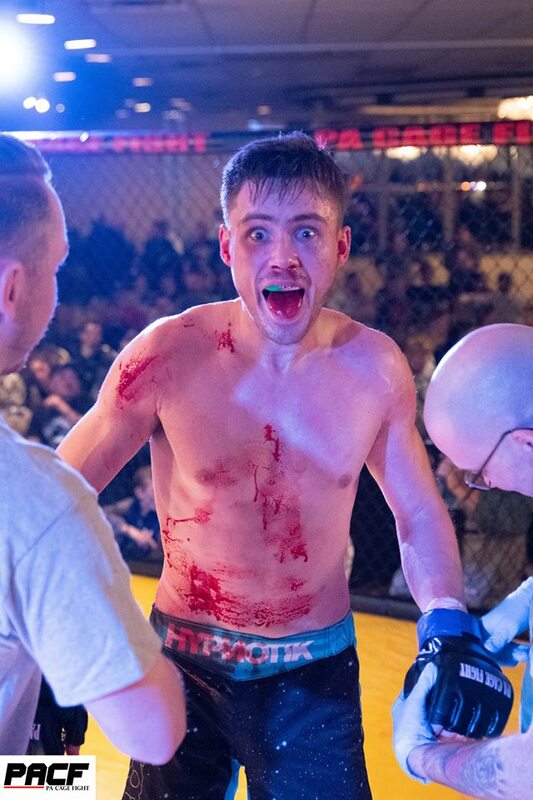 Time expires and both fighters are covered in blood. Promoter Paul Matreselva Jr. calls it “the bloodiest amateur fight in the history of PA Cage Fight.” Potts wins the bout unanimously on the scorecards. Devlin Bratcher of American Killer Bees met Joseu Santos in the night’s third bout. This one was over before it began. Super fast back and forth punches between the two, Santos throws a spinning back fist and drops Bratcher. Bratcher is dazed, Santos takes his back, flattens him out, and puts him out by way of rear-naked choke. Super impressive win for Santos. Lauren Strausser and Rachael Penkower competed in an atomweight (105-pound) bout which also served as the promotion’s second only female bout on record in 34 events. This bout was evenly contested on the feet as both competitors threw with both their hands and feet. Penkower lands a huge takedown and gets full mount before she works the ground and pound to the body. Penkower finishes the round throwing down bombs to the body. Penkower finds a home for her right hand early in round two, gets another takedown and works to pull Strausser off the cage. Her corner tells her to “beat up the ribs.” Thus far this fight is all Penkower. She lands mount again, then takes her opponent’s back and looks to work a reverse triangle choke and armbar combination before the time expires. Strausser shoots in for a takedown in the final round but Penkower grabs her head and works for a guillotine. Once on the ground Penkower works for full mount once again and begins the assault from top once again. This should be an easy one for the judges to decide. 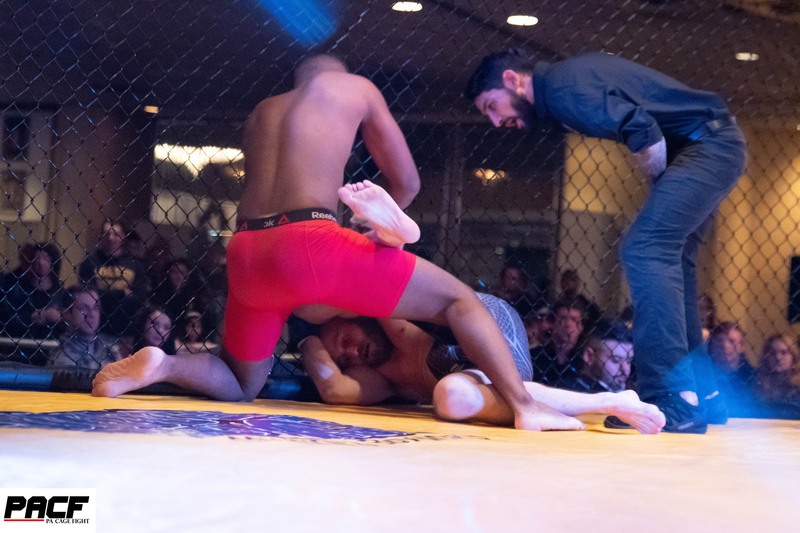 The final bout before intermission was an amateur welterweight title fight between Zach Miller of Rat Pack Fighting Systems and Marc-Ari Lewis of Tactical Combat Academy. Lewis threw a thunderous kick to the body of Miller. The kick was followed by a few punches before Miller took the fight to the ground and began to soften up the body of the fighter from Miami, Florida. The round and expires and we move to the second frame. In between rounds, Lewis’ corner shows their fighter a picture of what appears to be a family member. The gesture, obviously to inspire and motivate their fighter. Miller gets the fight back down to the canvas. Not much damage done in the round but definitely scored in favor of Miller who was on top. Lewis throwing big knees at the start of round three, looking for a Thai clinch. Miller gets the fight back down to the ground. Lewis pushes him off with his feet. Miller moves back in. Lewis reverses and gets on top but only for a brief moment. They stand and the fight comes to a conclusion as time expires. Lewis has the look of frustration on his face as he knows he will lose the decision. Miller wins the title unanimously. Following the interview it was announced that Joe Rivas was deemed medically unfit to fight against Thomas Crossan for the amateur 160-pound title. 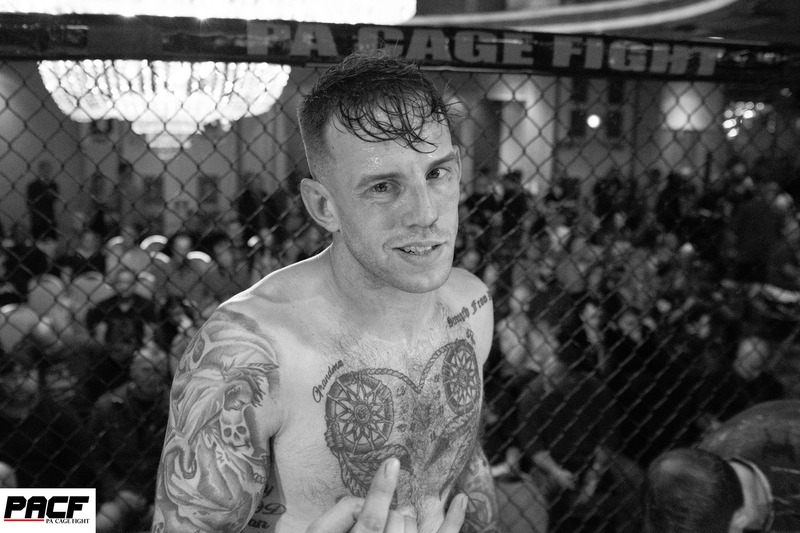 Crossan entered the cage where he was presented with the title and said he would like to defend against Rivas when he is healthy. 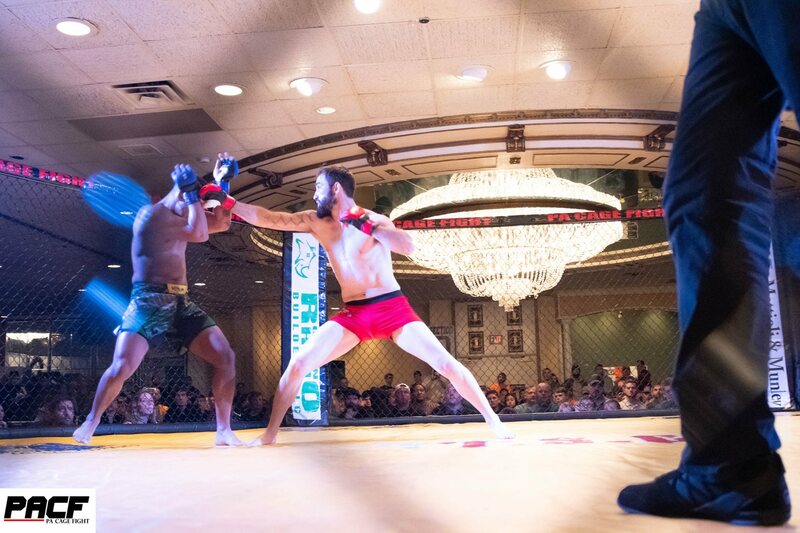 Lucas LaRue made his MMA debut in the first fight after the break. He took on Shaharyar Bhatti. Big pop for LaRue but he is rocked right out the gate. Bhatti connects again and it looks like LaRue is out. He slumps and works for a takedown. Bhatti takes his back, and seconds later submits LaRue with an armbar in the very first round. WOW!!!! Heavyweights Mike Erb and Austin Swoyer brought their bad blood into the cage and it did not take long for it to show. Before the fight even began the two were jawing at each other. Swoyer catches Erb early with big shots. The fight goes down to the mat and Erb has Swoyer in his guard. Swoyer throws down shots to the body. Erb is talking trash up to his opponent. Swoyer and Erb each find homes for their jab at the start of the second. Then Swoyer connects and backs Erb against the cage. In a flash, Erb now has the upper hand with his shot. He rocks Swoyer and comes forward. They continue to talk trash to one another. This is an absolute BRAWL! The pace slows down a bit in the third. Swoyer is on top and Erb is still talking. Will be interesting to see if the feud ends here. Austin Swoyer walks away with the heavyweight title. Timmy “Vicious” Tyler gets his first pro win after coming out with a straight left that rocks Michael Taylor. There is a brief moment where Taylor looks to work the head of Tyler but then Tyler tees off, dropping Taylor and continuing to land punches on the ground before referee Jimmy Chappell calls the fight off just 36 seconds into the contest. Ethan Goss and Branden Seyler Jr., fought in the evening’s co-main event. The two fighters were feeling each other out for the better part of two to three minutes and some of the crowd grew restless. When you have two fighters with this much experience and respect for one another, this often happens. Once the jabs and kicks started to be thrown, things picked up a bit. No significant damage. Then Seyler lands a takedown and Goss is working to get up. Goss has his back to Seyler. Eventually “the Wolverine” reverses and gets a standing guillotine choke. The round ends with Goss throwing down strikes to the head of Seyler. Jimmy Jordan returned to the cage after a lengthy layoff to fight in the night’s main event. 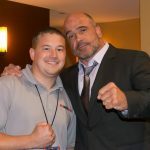 He met 10th Planet Jiu Jitsu Bethlehem and Finishers MMA standout, Rick Nuno. Jordan lands a jab that sets Nuno’s head back right out the gate. Jordan land a hard leg kick that turns Nuno right around. He does it again and trips Nuno. Nuno begins to favor the left leg. Nuno now attacks the body and moves. Jordan drops Nuno but he gets right back up. They touch gloves and Jordan goes right back to work on the leg. Nuno shoots but Jordan thwarts the attempt. Jordan connects withi a straight left. Time expires in the first round but Jordan should have that round 10-9. Nuno’s leg is a shade of purple now in round two. Jordan continues to chop. He drops Nuno again with a kick to the left leg. Jordan drops Nuno once again. Nuno having a hard time getting up. The referee almost stop it. Jordan lands several strikes from above. Nuno gets up and pushes Jordan against the cage. Jordan strikes and Nuno’s leg gives out. He falls. Jordan strikes again. They stand. Nuno is a wounded animal. Another chop to the leg buckles Nuno. Jordan gets on top in full mount. He then submits Nuno by way of keylock to end the night. Very impressive fight for Jordan after being away for so long. Joe Rivas vs. Thomas Crossan for amateur 160-pound title was cancelled moments before the contest. Rivas is unable to compete due to a medical issue.